This is the first time I've ever tried anything resembling gel polish. I have to say, I love the shine. It's like seche vite...but without the icky stuff. My camera/lightbox set up does not do the shiny justice. It's almost worth the trouble I had with the formula. It was thick and a little hard to manuever for me. But not "omg I haet this stuff" thick. Just a little bit thicker than I expected from a Sinful Colors polish. (the formula might not even be their fault. It has been warm and humid here, which makes a lot of polishes weird.) I used three coats in the above photos, but if you don't have ridiculously long nails, you probably only need two. This stuff also sets up pretty quickly, which surprised the hell out of me. About 5 minutes after painting my nails, I whacked my hand on the coffee table...and was sure I had ruined my nails. Nope, while they weren't complete dry, they were dry enough that the finish was intact. Hooray! This stuff might be good for those clutzes among us. All in all, if I can find them in-store, I might pick up another bottle. 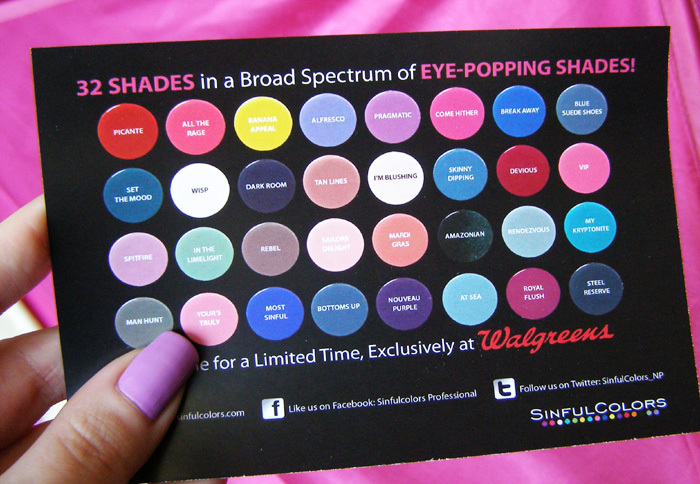 the postcard with all the shades. I kinda need a few more.